It’s been 100 years since Canada’s most-famous strike took place in Winnipeg. On May 15, 1919 nearly 30,000 workers came together – including police, firefighters, postal and factory workers, public and private sector employees – in solidarity on the streets of the Exchange District. The strike, now dubbed The Winnipeg General Strike, would last until June 25, with tensions reaching their apex on Bloody Saturday, when Mounties charged a crowd of strikers. During the strike, many – including the federal government and industry owners – saw too many similarities with the Bolshevik revolution in Russia of 1917, which overthrew the Tsarist autocracy, replacing it with the Soviet Union. Thus, the strike turned deadly, as workers were violently met in the streets while they marched, stopping the strike after six weeks of protest. The Winnipeg General Strike of 1919 would go on to initiate waves of sympathetic strikes across Canada, while also increasing unionism across the country. It was a first huge step in the collective bargaining rights and union recognitions that would finally be enacted some 30 years later. To mark the centennial, across the city you’ll find public events, exhibits, attractions, productions and tours that will be celebrating this pivotal point in both the history of the city, and Canada’s labour history. On June 21, exactly 100 years after the strike, Bloody Saturday will be unveiled to the public. 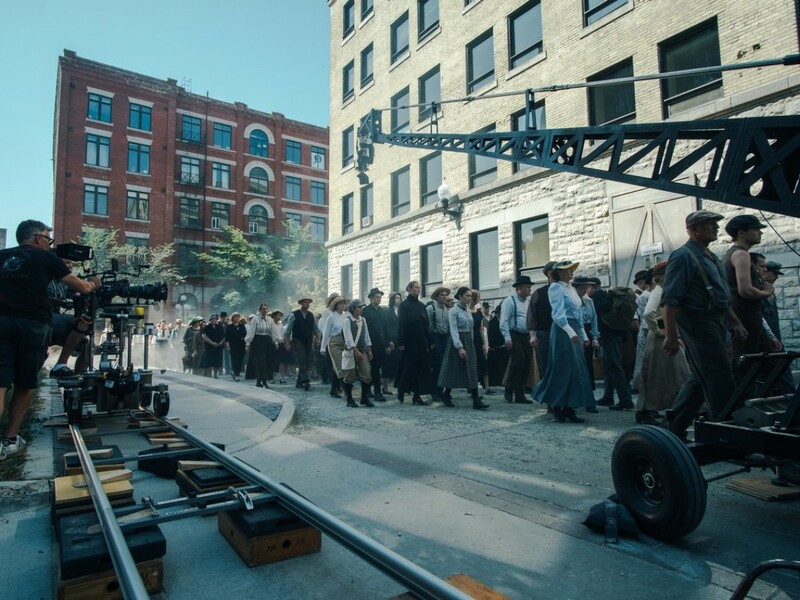 This large, permanent installation will feature a tipped circa 1919 streetcar, paying homage to one of the most enduring scenes from the strike, while being situated just a few feet from where the famous scene occurred. The installation will be two-thirds the size of the actual street car, and is designed by local artist/filmmaker Noam Gonick and the late sculptor/artist Bernie Miller, who passed away in 2017. Rainbow Stage, Canada’s largest and longest running open-air theatre company/venue, is kicking off their 2019 season with Strike! The Musical – which will also overlap with the actual centennial of the Winnipeg General Strike (June 18 to 28, and July 2 to 5). This is the second time the play has been featured at Rainbow Stage, having been staged in 2005, after its debut in Winnipeg’s Old Market Square in summer 2004. Since its inception, the play has gone on to hit many Canadian stages, garnering glowing reviews in the process, while CBC Radio recorded a production that was held at Winnipeg’s Burton Cummings Theatre in May 2007, which they broadcasted later that year on Labour Day (September 3). The play follows the plight of a Ukrainian immigrant named Mike Sokolowski who joins the strike (we won’t reveal, of course, how it unfolds), featuring music and lyrics by Winnipeg composer/playwright Danny Schur. Schur, along with writer Rick Chafe, has also adapted his play into a film which will be released this year. Stand! – which too is a musical – was shot in Winnipeg last summer and is directed by Robert Adetuyi, whose musicals include Bring it On! and Stomp the Yard. Following a similar plot to the original play – but with a more contemporary feel – Stand! feature’s Glee’s Marshall Williams in the lead role of Stefan Sokolowski, with Guardians of the Galaxy’s Gregg Henry as his father Mike. Actor Lisa Bell plays Emma Jones, a new role different from the play that was developed for the film (you can hear Bell sing in the video preview above). The Exchange houses many beautiful buildings, while their guides are always at the ready with saucy anecdotes, so this should be a good one – and a bargain at that, all for just $10 per person. The streets of The Exchange will be the scene for a parade in honour of the strike on May 25. This is being organized by UFCW Local 832, who will also be holding a social on May 11 (which is already sold-out), along with a Gala Dinner on May 15. The Solidarity Forever Parade will run from the corner of Market Avenue and Lily Street to Memorial Park in front of the Manitoba Legislative Building. Also on May 25 (and 26) in the Exchange District (and downtown), is Doors Open Winnipeg, which is a super fun, and very insightful event put on by Heritage Winnipeg. During Doors Open, guides provide FREE tours of some of the city’s most storied facades, taking you behind the scenes into Winnipeg’s historic buildings and telling the tales behind their foundation (both literally and figuratively) and how they’ve helped shape the city. This year’s tours will have a heavy emphasis on the strike, while you can find a full listing of the buildings you’ll get to explore here. The Exchange District, in particular Old Market Square, will also be the scene of a free concert featuring some notable performers including Ani DiFranco, Bruce Cockburn, Leonard Sumner, John K. Samson (of the Weakerthans), and Two Crows for Comfort. The concert is being called Rise Up 100: Songs for the Next Century, and is being presented by the Manitoba Federation of Labour on June 8 on the Cube Stage. A brand-new exhibit is now open at the Manitoba Museum called Strike 1919: Divided City. Transforming the Museum’s Urban Gallery – which depicts Winnipeg during the 1920s – the exhibit rolls back the clock to 1919, with new audio-visual elements and artifacts, including a documentary film that is being broadcast in the Alan Theatre that details how the strike came to fruition and how it changed Canada afterward. New interactive elements include the café becoming The Labour Cafe – a real soup kitchen run out of the Strathcona Restaurant (which was torn down to make way for the museum), while several of the rooms/stores will play oral histories that offer differing takes on the strike. Looking for an apropos place to stay to take in all these festivities? Some of Winnipeg’s 10+ Unionized Properties include: Alt Hotel Winnipeg, Fairmont Winnipeg, The Fort Garry Hotel, Spa and Conference Centre; Holiday Inn & Suites Winnipeg Downtown; Radisson Winnipeg owned and operated by Canad Inns; and the Victoria Inn Hotel and Convention Centre. As a final cheers, if you are looking to toast the Winnipeg General Strike we recommend Little Brown Jug’s (336 William Avenue) 1919 Belgian Pale Ale, whose name says it all, and whose flavour is an ideal marriage of sour and sweet with a mild finish – which, we suppose, is actually a contrast to how the strike ended. Things you can count on; an eventual spring thaw & a pint of 1919 for only $5 from the taproom.